Italy is great. Gelato is awesome and coffee bars rock. Rome was immense and Florence beautiful. And that was my Italian weekend. One slightly bizarre thing happened, however. 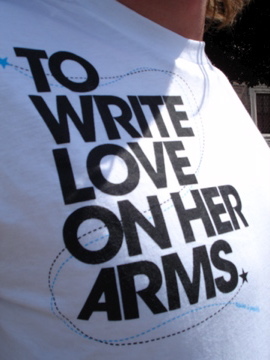 I was wearing a shirt from a ministry called To Write Love On Her Arms, which helps girls with addictions get into rehab and resort their lives, whilst wandering around Rome, when one guy walking past suddenly cried ‘Ah!! Beautiful! I love your shirt!! It is so beautiful!’. I mumbled something in Swahelli – (I was having great trouble speaking Italian – it seems my brain can only handle one language that isn’t English) – and then went over to Andy and Lauren to tell them about it, when he comes running back from around the corner with his fancy iPhone and asks to take a picture, proceeding to point the camera about an inch away from my chest whilst continuing to mumble how beautiful it was. I wonder, what chord the words struck with him. A similar picture to the one he took is displayed below. Oh and watching Italy struggle to draw with Romania in an end to end game with Italian people is MUCH more fun than watching it at home with Mark Lawrenson acting as a depressed co-commentator. Did you do anything for them other than buy that shirt? i’d imagine there is a lot of people who that slogan strikes a chord in. That’s awesome that you have those shirts over there! I have a lot of friends who are involved with the cause over here. Oh, and thanks for the ‘absolutely’ comment :).